An exhibition celebrating the life, art and vision of Virginia Woolf is about to open at the National Portrait Gallery in London. Media captionThis is the only surviving recording of the voice of author Virginia Woolf. 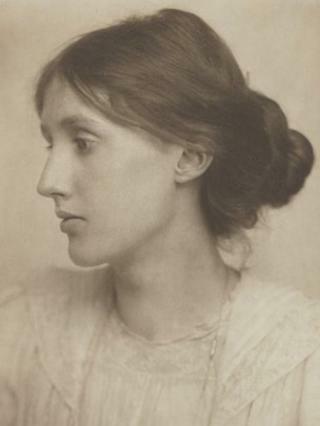 This is a famous photograph of Virginia Woolf taken in July 1902 before she was famous; before, in fact, she was Virginia Woolf. When George Beresford made this platinum print she was Virginia Stephen, the 21-year-old younger daughter of the Victorian author, critic and editor Leslie Stephen and his second wife Julia. It has been one of the National Portrait Gallery's best-selling postcards for the past quarter of a century. It is how the world wants to see Virginia Woolf: young and beautiful, elegant and vulnerable (she was between two major mental breakdowns). At this point in her life she had not had a word published nor started her writing career. In that regard, it is a misleading image. It is part of the process of history turning her into an alluring, romantic, fey pin-up - more Pre-Raphaelite muse than the towering literary and intellectual figure that she became. This image strikes me as more representative. The portrait is by her sister Vanessa, who - like Virginia - had recently been exposed to the ideas and art of Cezanne. Virginia's inner sadness is still visible, but she no longer looks vulnerable and delicate. She looks energetic and powerful: alert and critical. This is Virginia Woolf poised at the threshold of her remarkable career as both a writer and publisher. She had already started work on her first novel, The Voyage Out. The Bloomsbury Group was up and running. The Second Post-Impressionist Exhibition had been mounted by Roger Fry at the Grafton Galleries, and she had just married Leonard Woolf who had returned to London after a spell working for the colonial service in Ceylon. Then comes a setback. Virginia Woolf has another breakdown. She is close to madness. She shouts and screams and tries to take her life. The young, troubled couple move out of central London and rent Hogarth House in Richmond. This is a low point. They buy a printing press and start an imprint, The Hogarth Press. It was to be a hobby that changed everything. Virginia Woolf finds typesetting cathartic, and publishing the poems and short texts of other writers, inspiring. It is also an opportunity for her to produce short runs of her own experimental writing, which was not commercial enough to be of interest to Duckworth's, her publisher at the time. Vanessa Bell designs the covers for many of the publications. Virginia Woolf thought there ought to be a new approach to writing that reflected and responded to what she saw as a new world: a world that had been fundamentally changed by Einstein's revelations, technological advances, the ramifications of World War I, and the ideas of Freud and Marx. What had once appeared solid, now lay in fragments: certainty had turned into doubt. "Let us record the atoms as they fall upon the mind in the order in which they fall, let us trace the pattern, however disconnected and incoherent in appearance," she wrote in her essay, Modern Fiction. It was a call to arms to her fellow writers to find a new form, to "discard the conventions commonly observed by the novelist in an attempt to come closer to life". TS Elliot was her kind of writer. The Hogarth Press published The Waste Land a year after it had appeared in the October 1923 edition of The Criterion. She personally typeset the 434-line modernist epic. Virginia Woolf helped shape post-Victorian Britain, influenced the course of literature, and continues to touch writers and readers the world over. One image, from 1939, shows Woolf with her husband Leonard, in their Bloomsbury house, 52 Tavistock Square. Pinka, their cocker spaniel, sits in the middle. Behind them is one of three decorative wall panels Virginia Woolf commissioned her sister Vanessa and fellow artist Duncan Grant to paint. It's a beautifully composed, poignant photograph taken by Gisele Freund, an expatriate German living in France. A year later the house suffered a direct hit from a bomb and was largely destroyed, with Vanessa's wall panels exposed to the world like an open wound. A year after that Virginia Woolf took her own life: a sad end to the remarkable life of an individual who changed the world with her brilliant but fragile mind. Virginia Woolf: Art, Life and Vision is on at London's National Portrait Gallery from 10 July until 26 October.